A sample of the time period: box stoves used to warm Grace Church were replaced this year with a furnace installed for $150.43. Grace Church, New Lenox, and St. Paul’s, Manhattan separate. It is written that after this happened that there was an increase both materially and spiritually. Caleb and Alice Jones, ca. 1910. He came to Illinois with his parents and settled in New Lenox in 1861. For a time, the family were members of St. Paul’s Church, Manhattan. The time came, however, when it was possible to organize Grace Church, near Lenox, and Thos. Jones became the Senior Warden and held the office until his death in 1881, when Caleb, his son, succeeded to the office and held it until the present time…So, for thirty years, he has been Senior Warden of the parish and for nearly forty years a delegate to the annual Diocesan Conventions. Caleb Jones is survived by his widow, Alice Glass Jones, his son Legh, and daughters Bessie and Laura. L.W. 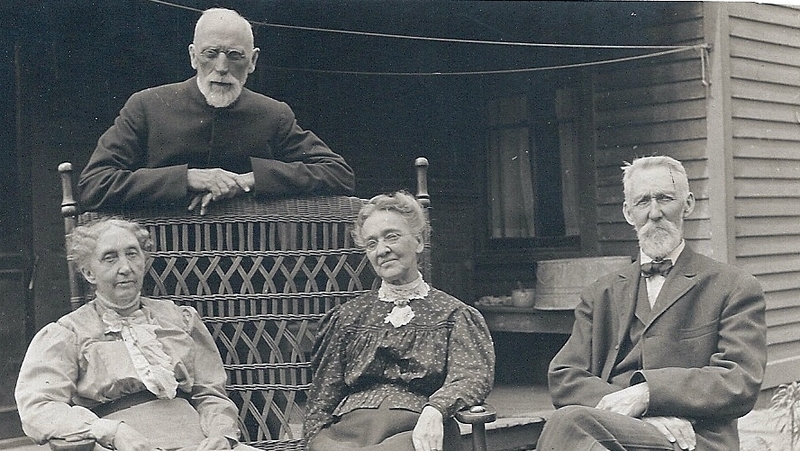 Applegate (standing) and his wife Rebecca (seated, left), return to New Lenox in 1912 for his second non-consecutive term as rector of Grace. Here they are seated with friends on the porch of the parsonage. This photo was taken in 1913. A new rector is an old rector (again!). The Rev. Legh Wilson (“LW”) Applegate, begins his second stint of ministry at Grace. He and wife Rebecca return to New Lenox for his second non-consecutive term as the rector. During this time, Applegate starts the custom of The Harvest Festival. A special service is held to celebrate the 48th Anniversary of the founding of Grace Church. Service Leaflet from Easter, 1918. In this year, Grace Church is still recorded as a parish — an Episcopal congregation that is able to be self-supporting. Bishop Anderson appoints Franklin C. St. Clair “Student-in-Charge” of Grace and St. Paul’s, Manhattan. He was called Lay Reader in Charge. The churches should be grateful to the fuel administration for allowing persons who are without other means of transportation to use gasoline on Sunday in order to get to church. Many a buggy has been called out of a well-earned retirement and all who have other means of reaching church have avoided the use of their machines. Better still, there is no indication of a tendency to use the order merely as an excuse for non-attendance at services. Grace complied with the order of the State Board of Health in holding shortened services in its well-ventilated and never overcrowded building due to the Influenza epidemic. Invite for the 50th Anniversary Reception on Saturday, November 16, 1918. “Special Rites in Memory of Fiftieth Year - Pioneer Families Support New Lenox Church Which Celebrates Golden Anniversary” Special service held at II o’clock in the Church followed by a dinner social at Grange Hall”. Due to the continual ill health of Mrs. Cowell we will not be able to attend the 50th Anniversary of Grace Church. I have sent kindly your invitation to my brother Herbert Cowell of Plainfield, IL. I can appreciate the fifty years of struggle since I first became acquainted with some of you dear people there as a child with my Father. Now that our country has entered the great war for freedom and peace, we need each other’s help more than ever. Also in the Parish Notes: Why not buy a Liberty Bond and strike a blow for peace? Elvesta Monk Batson dies; her cause of death was erysipelas and pneumonia. She was married to Ceward Charles Batson in 1896 by the Justice of the Peace in Englewood, IL. Elvesta was the mother of Lucille Dolores Batson who married Will Drake, mother of Ceward William Batson and Clyde Mark Batson. Mr. and Mrs. R.W. Jones wish to express their thanks to the New Lenox people who assisted at the burial of the remains of their son on Sunday, December 8th, 1919. Services were held in a chapel in Chicago in the morning, and at New Lenox in Grace Church and at the cemetery in the afternoon by the Rev. L.W. Applegate, an uncle of the deceased. Mr. Jones was also related to Mrs. Caleb Jones and to other residents of New Lenox and vicinity. Grace Church Roll of Honor: Ceward W. Batson, Squadron 6, Naval Aero Station, Pensacola, Florida. Bishop Sheldon M. Griswold is now working on plans for the future care of the work of Grace Parish, so that there will not be any break in the services. In this year, electricity is added to the church. Also, in this year, the false ceiling of wood is laid on the bottom crossing of the scissors truss in the sanctuary. Lowering the church ceiling helped to conserve heat. Adele Fay Williams sketched an illustration of the church and wrote this article on the occasion of Grace’s 60th Anniversary year. Grace celebrates its 60th Anniversary this year (see article to the right). St. Paul’s Episcopal Church, Manhattan, IL, celebrates its 75th anniversary of the dedication of the church. Also, this year marks the 26th anniversary of Major John Henry Smale as Lay-Reader-in-charge. The New Lenox congregation joined with the Manhattan group and their pastor, Mr. Glenn Reddick, a student at Western Theological Seminary at Evanston, assisted at the altar with Arch-deacon Zeigler. Grace Church entered the International Canning Contest “A Century of Progress” at the Chicago World’s Fair. The Rev. Vernon L. Shattuck Jones began his work as seminarian-in-charge from Seabury­ Western Seminary beginning Lent 1936 (ordained a deacon August 3rd, 1937, and the priesthood in July, 1938, at St. Bartholomew’s Church Bemidji, Minnesota). He would return to Diocese of Duluth at conclusion of seminary June 5th, 1938. The Rev. William J. Wyckoff serves Grace for under one year. In November 1944, Wyckoff wrote Father Spinner a letter: “You may be interested to know that I am now deep in the wilds of New Guinea, a place which is undoubtedly one of the worst spots on earth. See Bulletin from St. Ambrose Episcopal Church, Chicago Heights, IL, in our church archives. A new vicar, The Rev. Ralph J. Spinner, B.D., begins at Grace. His son Peter Michael was born in 1943. Lived in Chicago Heights, IL, not in Grace Vicarage in New Lenox, IL. Spinner was a wonderful “cartoon” artist and we have some of his art in our Grace Archives. New vicar Rev. John M. Cleveland begins his three-year tenure at Grace. In this year, the vestibule of the church (the entryway) has been completed. The renovation work on the steeple nears completion. Annual Church Carnival to be held on the Church lawn. Our Bishop (name?) objects to our having bingo, considering it is a form of gambling, it was decided we would have to eliminate our main attraction.” - Rev. Cleveland, Rector. In this year, beloved couple Doris and Wendell “Coope” Cooper made Grace Church their home. Their children were Martin, David, and Wendy (Wendy and her husband Kevin Reeves are still members of Grace to this day). On September 10th, Mrs. Elizabeth Pester died, followed by Charles P. Gougar’s death on the 18th of September.